Cytogenetics Lab, Institute of Mother and Child, in cooperation with CompBio group at the University of Warsaw, presents a demo of a research & clinical tool IMID2py now empowered with Apache Stanbol. In our solution, user creates a tree of enhancements for her/his content: this is a small part of a LOD cloud which users find relevant. 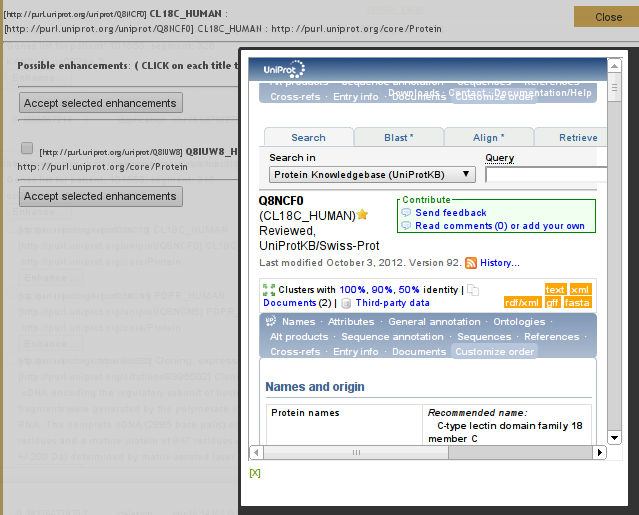 A user is able to search for enhancements thanks to Entityhub with pre-indexed linked data from large open databases: UNIPROT, PubMed, eHealth. Users explore Linked Data by asking semi-automatically generated queries, and by reviewing results returned by Stanbol Entityhub. We’ve provided several enhancers based on Stanbol Entityhub query language. Finding out from our users what is most useful, and providing them with useful tools is what we’re trying to achieve. IMID2py is used at the cytogenetic lab to review aCGH (array comparative genomic hybridization) results from our patients. A geneticists job is to assist doctors in stating clinical diagnosis. However, since genetics is a very rapidly developing field, part of the job is to perform research on difficult, unknown, cases. By allowing users to easily document their research path in the tree of enhancements, and later search among, and create reports of their findings, we try to enable reasonable use of constantly-growing Linked Data. Further development will provide more enhancers and Enhancement Chains, abstraction of available enhancers to facilitate more thorough, more automatic research and reporting. You’ll find the demo quick tour on the demo site. You can watch video screencasts from the demo here. Entityhub provides indexed Linked Data, finds entities and performs more complicated queries. Contenthub stores content enhancements, labels them, and provides faceted search. VIE Autocomplete provides auto-complete search among indexed Linked Data. For the purpose of this demo UNIPROT linked data was indexed using Apache Stanbol tools. 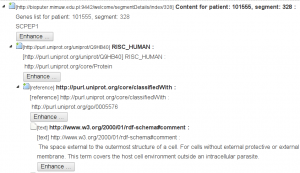 UNIPROT RDF release, which also contains following Linked Data: Gene Ontology terms, PubMed abstracts, GeneID references, and more. 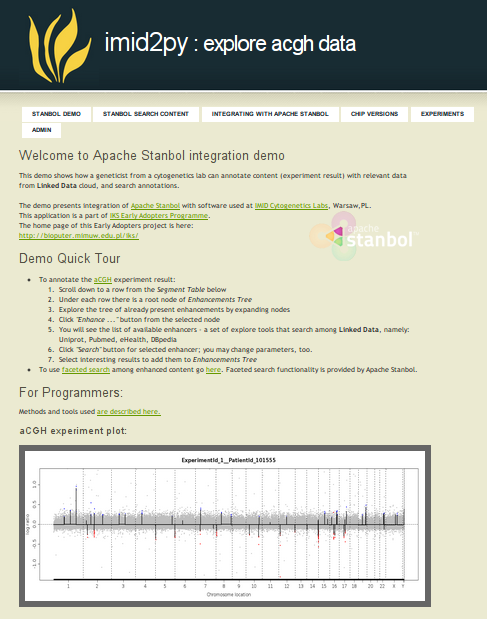 Another Linked Data set available in the demo is eHealth Apache Stanbol demo set. A Stanbol connection module in Python (on github) was created for the purpose of this integration. The demo presents integration of Apache Stanbol with software used at IMID Cytogenetics Labs in Warsaw. This demo is a part of IKS Early Adopters Programme.